Hook & Ladder Company No. 8, a historic New York City landmark is most notably famous for its role in the movie “Ghostbusters”. 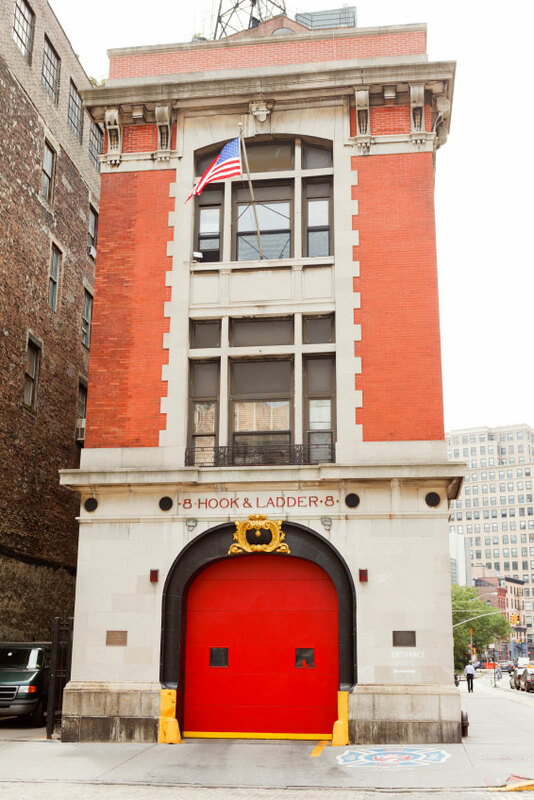 The photo below features the fire station’s exterior, which may look familiar since it was used as the Ghostbusters’ headquarters in the 1984 and 1989 movies. In 1904 the Hook & Ladder Company No. 8 moved to its new fire station located at the intersection of Varick and Moore Streets. The building was designed by Alexander H. Stevens and made from brick and limestone, with arched entrances for the fire trucks. The original building was double the size of what currently stands. In 1913 Varick Street was widened and the building either had to be relocated across the street or cut in half. Due to financial constraints the Fire Commissioner made the decision, the building would simply be cut in half and thus saved the building from demolition. The building was saved again in 2011 after being placed on Mayor Michael Bloomberg’s list of 20 fire stations slated to close. The New York community responded with frustration and protests. Today Hook & Ladder Company No. 8 is still an active fire station and often visited by fans of the 1984 movie Ghostbusters.